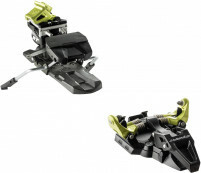 Questions often come up about the difference between the Dynafit TLT Radical series of alpine touring bindings and the Dynafit TLT Vertical series. Both lines feature an ST version and an FT version with comparable weights, with the Verticals coming in around $50 cheaper in each. Why the price difference? How are they different? Let us explain, starting with some history. Dynafit is a well-known ski mountaineering company based in Austria, and they've made their name manufacturing ski boots and pioneering so called "tech" bindings. 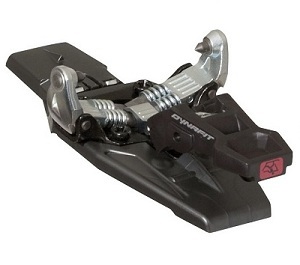 Although the original designs are credited to an Austrian family named Barthel, Dynafit gets credit for commercialization of the four-pin technology under their flagship TLT brand in 1990. 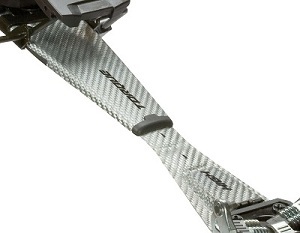 TLT stands for Tour Lite Tech, hence the name "tech" bindings. Over the span of a couple decades, the TLT evolved into a Speed model and a Comfort model, both of which were proven by years of field testing and refinement. Today the Speed model is mainly found in Europe, while the Comfort model has morphed into separate Vertical and Radical models available in the United States. The Radical series has an additional Speed model with no brakes that effectively replaces the original TLT Speed in the US. 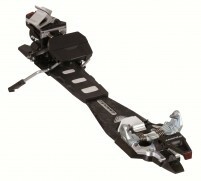 The Dynafit Radical series features the same basic innards but has what Dynafit calls a Speed Step climbing bar (the grey pieces on top), which enables the riser to be adjusted without rotation of the whole unit. This was ostensibly done to help ease riser adjustment on the fly with a flick of the ski pole. In practice, that can be true but takes some getting used to. There can be some difficulty separating the two risers using the basket of a ski pole while on the move, but it's pretty straightforward while stopped and focused on the task. 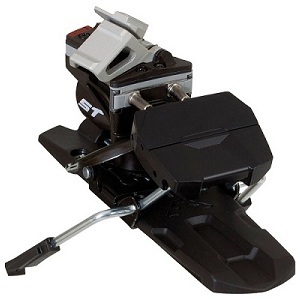 The toe locking lever has also been improved to add leverage, but both are perfectly capable devices and easy to use. Be careful of pinching your glove or mitten under the new Radical lever, as it can cause a tear if you pull too hard. Note the Radical version is wider, which contributes to it being 69 grams (2.4 oz) heavier per binding. 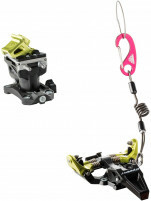 In contrast, the Radical ST is only 20 grams heavier than the Vertical ST, which leads one to believe there is some extra oomph in the shock absorber mechanism of the FT. All versions have the ability to add a crampon to the toe, though the Radicals have slightly different machining which seems easier to work with. So how to decide? 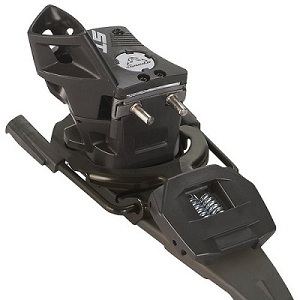 If you like to huck cliffs, the Radical's shock absorption is probably worth the extra 50 bucks. 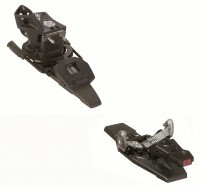 If not, it comes down to skier preference on which riser mechanism you find easier to work with. If you don't like the idea of trying to separate possibly ice-covered riser plates with a pole basket or mitts, go with the more classic Vertical series. 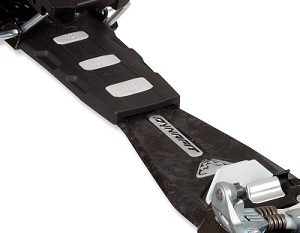 If you don't like the idea of rotating your binding just to change a riser height, go with the Radicals. 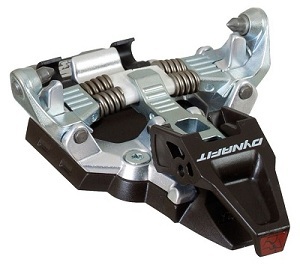 In the latter case, you'll get a bonus upgrade to ease-of-entry, side impact protection, and crampon access to boot. We think you'll be happy with either, as you'll certainly be rocking some sturdy tech bindings that won't weigh you down. - Update 2/15/2014 - Please note that Dynafit has discontinued production of the Vertical FT binding for the 2013/14 season. They recommend either the Radical FT or Vertical ST instead. Having owned a set of Vertical FTs I feel completely confident saying that the fiberglass plate does not do anything. I cut mine off to simplify mounting and I think that a piece of cardboard would offer as much support. That said I love the bindings, but only bought them because Radicals weren't available when I ordered them. Gotta love the Dynafits. I have Scarpa Maestrale boots and Dynafit Vertical tech bindings. The boot heel does not fully depress the brake plate. I understand this is by design. How much clearance should there be between the bottom of the boot sole and the brake when the brake is fully compressed? Hi Thor, there isn't a specification for that distance since A/T boot soles can vary.